Now that the site of the famed Abbey of St Edmundsbury has been taken over by the Corporation for the purpose of providing a public park, it may be of interest to trace the descent of the property, and to note a few incidents that have occurred since the Dissolution in November, 1539. "Pleasyth it youre Lordship to be advertised that we have been at Saynt Edmondsbury, where we found a riche shryne, which was very comberous to deface. We have taken in the seyd monastery in golde and sylver 5000 markes and above. Besyds as well a riche crosse with emeredds as also dyvers and sundry stones of grete value; and yet we have left the churche, abbott and convent very well furneshed with plate of sylver necessary for the same. And we assure your Lordship the abbot and convent be very well contented with everything that we have done there, as knoweth God, who preserve your Lordshipp. "As an exparte statement the content(ment) of the Abbot and convent seems scarcely convincing." The history that follows is based upon Horace Barker's account up to 1912, and then brought up to date. 1539 The property of the Abbey of St Edmund was surrendered to the Crown on 4th November 1539 but much of the wealth had already been confiscated in the previous year. 1560 On 14th February, 1560, Queen Elizabeth in consideration of £412 19s 4d. paid by John Eyer, Esq., granted him (inter al) "All that the site, circuit and precinct of the late dissolved Monastery of Bury, otherwise called "Bury St Edmund" amongst the specified lands and buildings being the Dorter Court, the Garners, the Abbot's Stables, the Gate House the Great Court, the Pallaies Garden, the Lecture Yard, Bradfield Hall, the Pond Yard and the Vine." 1617 On April 29th, 1617, licence was granted to Mary Middlemore, maid of honour to the Queen, to search for treasure in this Abbey (Rymer). But there appears to be no record of what (if anything) was found. Was it at this period that the marble slabs formerly covering the coffins of the Abbots were removed? 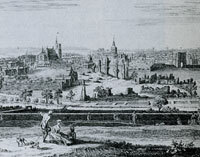 1621 Probably the earliest known Botanic Garden in Britain was set up in 1621 at Oxford University. However, at this early date its purpose was as a physic garden growing plants for medicinal research. Physic gardens had been well established since at least Tudor times, but probably date back to the monasteries in their most extensive forms. A similar Physic Garden at cambridge would wait until 1762 before being established. 1623 Yates list of owners has Robert Lord Spencer and Henry Clarke taking possession in this year, but the price of the property had risen to £1,000. 1625 Sir George Hastings became the new owner. 1664 Roger Barnes had to pay £1,130, in order to buy the property. 1672 Samuel Halls was the next owner recorded by Horace Barker. 1675 John Halls	inherited the grounds. 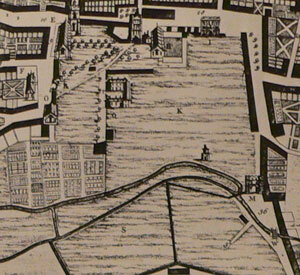 1720 Major Richardson Pack bought the Abbey precincts, including the Vinefields, but excluding the Great Cemetery. The price in 1720 was recorded as £2,800. The Abbot's Palace had been refurbished, which explains the high price. Major Richardson Pack was the man who demolished the Abbot's Palace. The mansion in the abbey grounds,lived in by Sir John Eyer in the late 16th century, and now known as the Abbot's Palace, was demolished on Pack's orders. 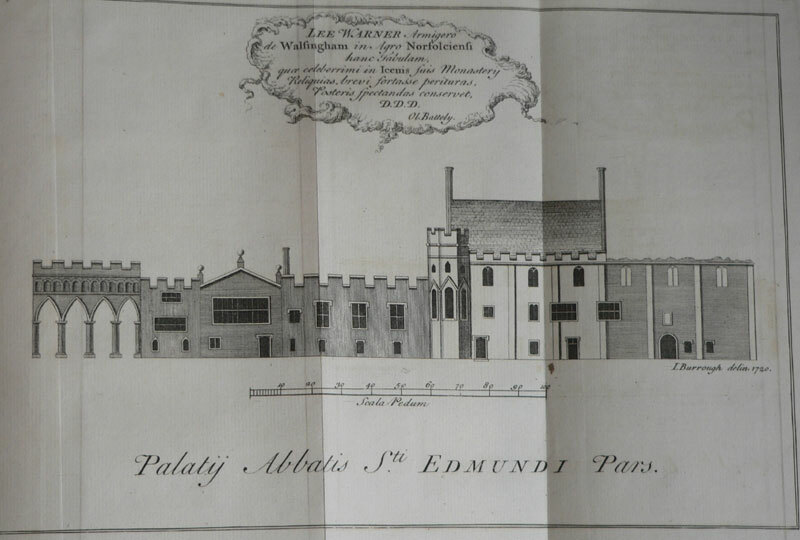 The picture shown here is of the Abbots Palace drawn in 1720 by J Burrough, the year in which the palace was demolished. Sir James Burrough was a well known antiquarian and amateur architect in the area. He himself had amassed a collection of notes and drawings on the antiquities of Bury, which he would leave to the library of St James's Church. This picture was published in Dr Batteley's 'Opera Posthuma' of 1745. 1727 The area was acquired by the Davers family, who used it as the large garden to their town house at Abbey House on Angel Hill. 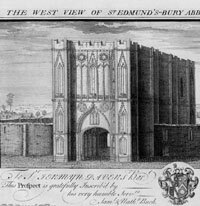 1738 This picture is one of a series of engravings that Samuel and Nathaniel Buck made of British towns, castles and abbeys. Each engraving has a dedication and brief description of the place in question. The Buck brothers were important topographical artists in the 18th century. 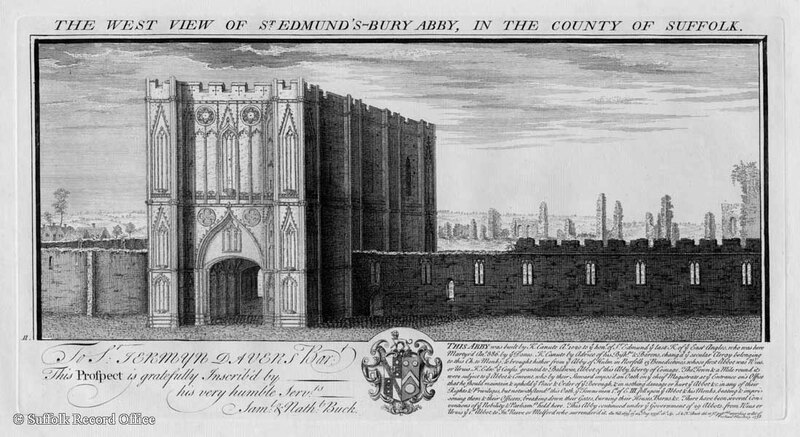 This engraving of Bury Abbey shows the Abbey Gate, and is dated 1738. The Buck brothers returned to Bury again in 1741, for another of their 'prospects'. 1741 In 1741 Alexander Downing produced this plan of Bury St Edmunds with West at the top of the plan. 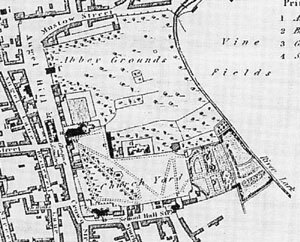 The outline of the Abbey Grounds looks more like a drawing of the view from the Vinefields, rather than a proper plan from overhead. Thomas Warren would produce a much better plan in 1748, with a proper measured scale, but that plan is much less readily available than a second edition produced by his son in 1776.
blank In 1741 Samuel and Nathaniel Buck published this engraving of the East Prospect of the town and Abbey ruins of Bury St Edmunds. The Buck brothers were already well known for their views of ruined castles and abbeys throughout the land. If you click on the thumbnail you will see the full view as published. 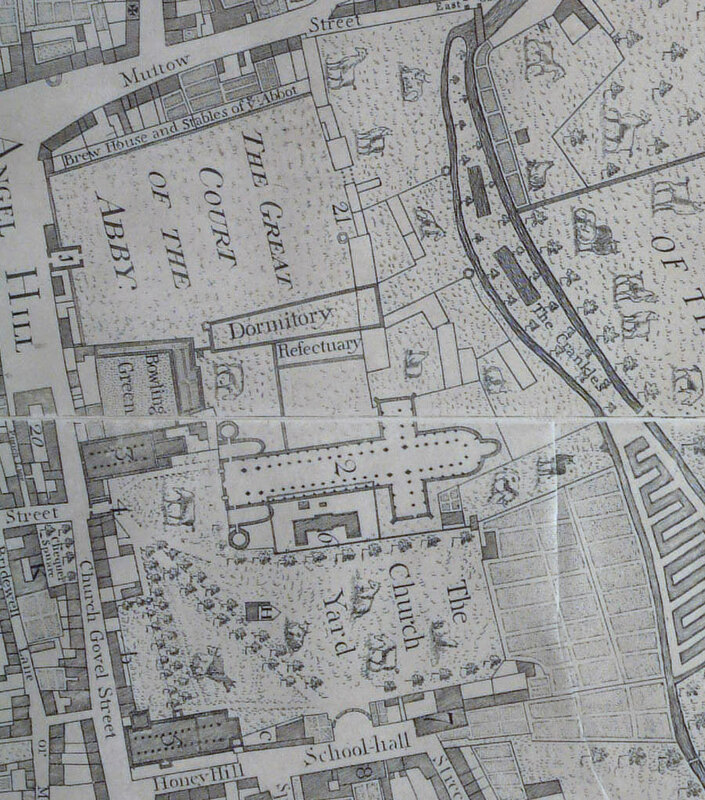 It shows the fish ponds in the abbey grounds still visible in 1741, together with both the River Lark and the River Linnet running in parallel through the abbey grounds. The Norman Tower is shown with a pitched roof and a spire. Two windmills are visible in the distance, as is Cupola House and the Market Cross. 1751 The idea of improving the mind by scientific pursuits was well established by the 18th century. One later aspect of this belief was the classification of plants, their properties, and the searching out of foreign and exotic varieties. In 1751 the widow of the Prince of Wales, Princess Augusta, laid out 9 acres of her garden on the banks of the River Thames at Kew as a botanic show case. This garden would eventually evolve into the Royal Botanic Garden of Kew, which today covers 300 acres. 1762 The original Botanic Garden of Cambridge University was founded in 1762 in the centre of the City, now known as the New Museums Site. This small Garden was conceived as a typical Renaissance physic garden, inspired by the Chelsea Physic Garden in London. It grew herbaceous plants used in the teaching of medical students at the University. The Cambridge Botanic Garden that we know today was founded in 1831 at a new site. 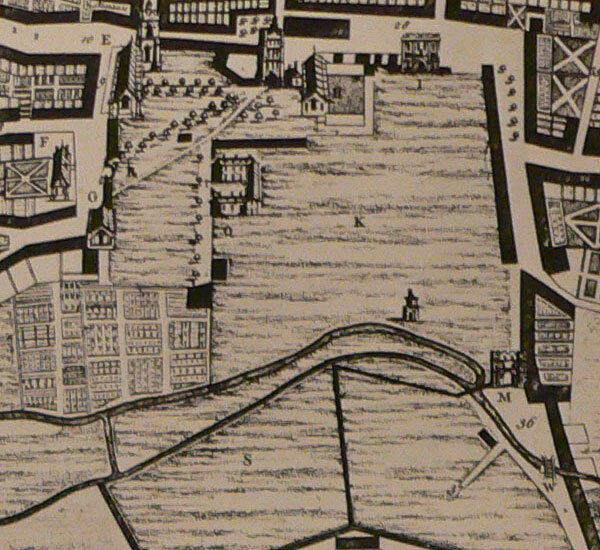 1776 Thomas Warren junior's map of Bury St Edmunds in 1776 shows the Abbey Grounds together with Warren's detailing of the original abbey layout. The layout of the original map showed east at the top of the page. Here it is rotated to show north at the top in order to fit in with the alignment of the later maps. Unfortunately it is unclear how much of the map is illustrating real remains above ground and how much is reconstructed from Warren's observations. Other sources tend to confirm the view that the River Linnet did not join the Lark at its present day confluence, but joined it at the Abbot's Bridge, and that this was still the case in 1776. This map has only a few minor and essential changes from the plan produced by Warren's father in 1748. 1804 Mrs Davers and Sir Charles Davers now became the owners of the Abbey grounds. He was Bury's popular MP for 28 years, and would leave it to his nephew, Lord Bristol. 1806 Sir Charles Davers died in 1806 "when the scite of the Abbey and the Stewardship of the franchise, descended to the second sister's second son, Frederick, now Marquis of Bristol." 1818 In 1818 a newcomer to the town of Bury St Edmunds was to leave behind him a legacy which is still enjoyed today. His name was Nathaniel Shirley Harness Hodson, aged about 35 years old, and he intended to start a new enterprise which would turn his hobby into his full time occupation. Born in Cambridge in 1783, Hodson had lately worked for the War Office in London since about 1800. In London, Hodson had lived at Lambeth, and had made some contributions to botanical magazines, which he had based upon what he called, "my small but valuable collection of plants grown at my residence in Chapel Field, South Lambeth." It seems that he hoped to turn his hobby into his profession, and had looked for a suitable town which lacked such a facility, but had local well-to-do inhabitants who might have the means to pay to visit such a scheme. By this date the Royal Botanic Gardens at Kew had been extensively developed on a scientific basis under George III and Joseph Banks, both of whom had brought Kew up to a peak of excellence. The idea of displaying plants to the public in a scientific and systematic layout was now a well established and fashionable idea. 1820 By 1820	Nathaniel Hodson had transferred his personal collection of plants to the new botanic garden at the east of the Churchyard in Bury St Edmunds. John Lenny's map of 1823 shows the site of the botanic garden at the south eastern corner of the Abbey Grounds. It was approached through the churchyard, and 'Botanic Gardens, The Churchyard', was its address.Today (2013) this site is a carpark, and contains the Suffolk Archaeology Service building. The site was three acres in extent, but running down to the river, parts of it were marshy, and liable to flooding in bad weather. He had to pay a rent of £60 a year for this property. In the Probate of his will he was described as a "Gentleman", and he must have had sufficient means in hand to finance this enterprise. However, he needed a Curator for the collection, and to meet his salary and the general maintenace costs, he had appealed for subscribers to pay two guineas a year to support the Garden, and to allow free access to it for those able to meet this commitment. On 7th June he advertised in the Bury and Norwich Post to remind the "Nobility, Gentry and inhabitants in general" that subscriptions were now due, and should be paid into Oakes bank, as the business was due to open on 24th June, 1820. However, there would be no admission tickets issued until the Walks were sufficiently established. Within a short time Hodson had gathered 133 subscribers, of whom, 30 were women. The subscribers included Sir Thomas Gery Cullum, the botanising 7th baronet of Hardwick Hall. A further subscriber was the Curator of the Cambridge Botanical Garden, Mr Arthur Biggs. Both of these persons illustrate the serious scientific side of Hodson's new venture. 1821 By 1821 the Botanic garden was receiving donations of plant material and seeds from a wide variety of sources. The Bury and Norwich Post reported donations from the Gottingen Royal Gardens, and some seeds from Syria and Egypt. Many of the noble subscribers also gave donations of plants grown locally, but no doubt with exotic origins. In March the BNP also referred to a medicinal plant, the Water Plantain, which could be seen in "the Aquarium of the Botanic Gardens." No doubt Mr Hodson was making use of his riverside location to have a display of water plants, some of which, like the water plantain, had local origins. Although it was a common enough plant, it had a reputation as a cure for hydrophobia, or rabies. It could be seen easily along the River Lark, its adjoining water meadows, and at Mermaid Pits. 1822 In 1822, Hodson issued at the price of 3s., "a catalogue of hardy trees, shrubs and herbaceous plants" in the said garden. The list was compiled by J Denson, the curator and "comprises 1,534 varieties." From the start, Hodson knew he had to appeal to as wide an audience as possible. He described the site as, "an ornamental and scientific garden for the recreation and amusement of the inhabitants of the town and neighbourhood." The catalogue of plants also contained a list of subscribers which included the Dukes of Norfolk and Grafton, the Marquis of Cornwallis and the Earl of Euston. Each paid 2 guineas a year. In December, 1822 it was announced that the Botanic Garden would be extended by a plantation leading to the River Lark. This would include grassy walks with suitable seating for the recreation of subscribers. 1823 One of the subscribers was a Herr Fischer of the Botanic Gardens in Gottingen. He was probably responsible for sending Hodson a thousand packets of foreign seeds from the "first establishments on the continent". Gottingen Botanical Gardens in Germany had been established in 1736. 1824 By 1824 Hodson had increased his subscribers list to 160, of whom 43 were women. In October 1824 the Countess of Bristol and her daughters, the Ladies Hervey, visited the Botanic Garden, probably for the first time. 1825 In February 1825, a French representative of the Paris based florists, Guillard and Co., arrived in Bury St Edmunds with a selection of trees, shrubs and seeds from Versailles, and offered them for sale. Most of his roses and shrubs, together with many of his seed packets, were bought by the Botanic Garden. The roses were a particular attraction. The summer of 1825 was hot and some of the Bury Botanic Gardens tropical plants were noted for their excellent growth in the conservatory on site. This was an unheated conservatory at this time. The Botanic Gradens at Bury St Edmunds were not just on the receiving end of plant donations. Lord Milton's plant collector attended the Bury St Edmunds site in the Autumn of 1825 to gather seeds to send back to Wentworth House in Yorkshire. In return, his Lordship sent Hodson a selection of tropical seeds and rare plants to add to Bury's collection. 1826 Lacking heated greenhouses, nevertheless, Hodson was glad to receive tropical seeds from donors. If he felt that he did not have the facilities to grow them properly, he would exchange them with other growers for more suitable material. In June, the Bury and Norwich Post noted that Dr Gregory, one of Hodson's subscribers, had given him seeds from New South Wales, Van Dieman's Land, and Africa. Hodson could pass these on to Gottingen in return for more hardy material from the continent. Hodson also sold surplus material to his subscribers for their own gardens, while in November he was paid £20 to lay out and plant up a new garden for the Suffolk General Hospital. 1827 In March 1827, the Gardeners Magazine published a letter from Nathaniel Hodson describing the Botanic Gardens at Bury St Edmunds. This letter provides some idea of the form of the gardens. He noted that he had added two additional acres of meadowland for ornamental trees and shrubs, with spacious grass walks and rustic seats on the margin of the River Lark. The upper part of the garden had the ornamental and showy plants, with long narrow beds containing the classes and orders of the Linnean arrangement. Walls enclosed two thirds of the garden, and were lined with climbing plants and shrubs. The river could be crossed by a rustic Swiss bridge. He ended by writing that families living over 10 miles from the gardens could have a reduced subscription of one guinea, and strangers could obtain a day ticket if they applied to one of the existing subscribers. 1828 The 1828 Summer Assizes at Bury St Edmunds included the sensational trial of William Corder, following the murder in the Red Barn. Large crowds attended the trial and many of the better sort also visited Hodson's Botanic Gardens. On 20th August the local papers noted that visitors included Lord Chief Baron Alexander, Sir William Rowley, Sir Charles Blois, Sir William Parker, Sir Robert Harland and many other gentlemen from different parts of the county. Bury St Edmunds Horticultural Society was founded in 1828, and immediately set up an annual show. Plants were shown by Nathaniel Hodson and his curator, Mr Turner, at every show for years to come. 1829 Voices now began to raise the idea that an added attraction to the Botanic Gardens would be desirable. The Bury and Norwich Post of 3rd June, 1829, reported that many of the subscribers "are desirous that a military band should be in attendance," for one evening a week, as was the custom at Botanic Gardens in Liverpool and Bath. In truth, there was probably no space for this to be a practical proposition, and with the growth of visitors, Hodson began to look for a bigger site for the gardens. 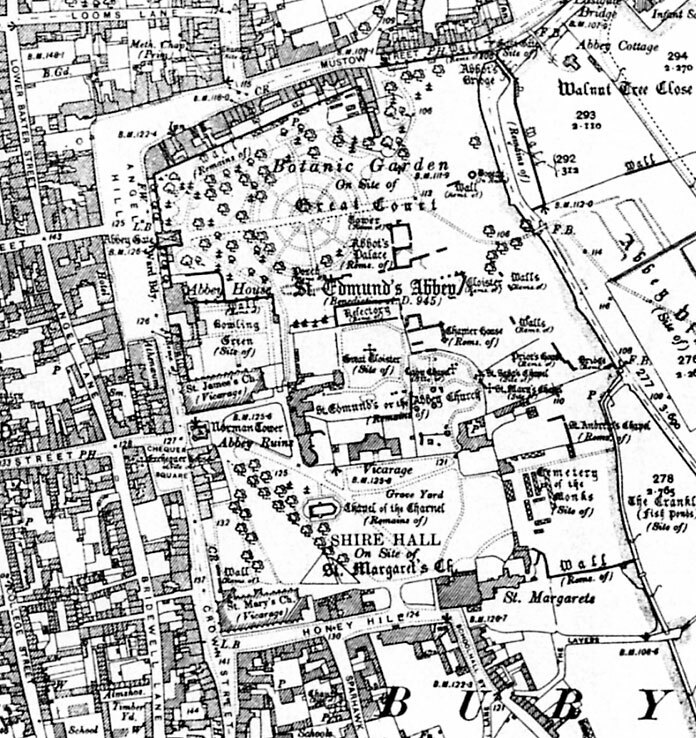 1830 The most obvious site for an enlarged public garden was within the Abbey Grounds, which since 1806 had been in the possession of the Marquis of Bristol. By the Autumn it had been agreed that Hodson could rent six acres on the site of the Great Court of the Abbey, for £60 a year, the same rent that he had already been paying at the old site. As the area had been used as a private garden for Abbey House on the Angel Hill for many years when the Daveys were in residence, the walls were covered in fruit trees, and the soil was in good heart. This compared very favourably with the swampy nature of the lower parts of the existing Botanic Garden. In addition, the whole site was located more favourably, and graced by the Abbey Gate and surrounded by picturesque ruins. In November the new site was public knowledge, and the Bury and Norwich Post for 17th November called it "highly eligible for the contemplated purpose", and questioned whether anything more beautiful is to be found in the kingdom. As part of the new arrangements it was thought necessary to remove two of the trees on the Angel Hill in order to open up the vista from the gardens to the Hill. Naturally there were local objections to this, which Hodson countered by pointing out that they were decayed, and full of nails. This arose from them being used as lampposts, and in former times for suspending drying lines. Work also got underway in laying out the new site, and transferring some of the specimens from the old Botanic Garden. 1831 By the Spring of 1831, Hodson was so confident of achieving a good transition to the new area that he sold the lease of the old Botanic Gardens to Sir Thomas Gery Cullum, 7th Baronet, of Hardwick House. Cullum apparently intended to convert it to an ornamental cemetery to supplement the Churchyard. Improvement work extended beyond the Abbey Gate, with planting on either side of the Abbey Gateway itself on the Angel Hill. The Corporation owned the land on the north side, and gave it up for planting so as to match the south side owned by the Marquis of Bristol. Although the planting and layout were still far from complete, the subscribers were given free access to the new area during the Summer Assizes, and strangers could be admitted for the sum of one shilling. The ticket also covered admission to the old garden area, which was yet to be cleared, presumably by agreement with Sir Thomas Cullum. On 20th July, 1831 the Bury and Norwich Post gleefully reported that a band would be playing during the temporary opening period. Work continued into the Autumn, and included changes to the ruins as well as the grounds. "Incumbrances upon the old Palace have been removed, by which the bases of the pillars in the interior of one apartment are exhibited in fine preservation, and the ancient remains are divested of some unsightly modern additions." In addition a new entrance was created from the Abbey Grounds into the Churchyard. This would help the progress of transferring plant material from the old garden, but would be an amenity for visitors as well. The move to a new site initiated a new stream of donations of plants and trees from local donors. A further temporary opening period was allowed for the Bury Fair, held in October, 1831. Many fashionable and elegant new ladies were seen in the Gardens. After the Fair was over attention turned to the entrance gateway on the Abbey Gate itself. By November the palisade was in place, and masons were engaged upon the stonework. For years there had been complaints about the existing unsightly gates, and the B & NP was looking forward to their replacement by something in character with the new ironwork. By December the new layout for the Botanic Gardens was unveiled. The central feature was a one acre circle of concentric beds based on the Royal Botanic Gardens in Brussels. The radii were intersected by a long walk from the Abbey Gate, and the area divided into 24 beds or compartments, eight of which formed an inner circle, leaving sixteen surrounded by a gravel walk. The remainder of the leased area would be devoted to beds for roses and ornamental plants, and for lawns and an arboretum. Meanwhile a new house for Hodson was being built within the grounds. Today this house is known as Alwyne House, and by 2013 it is a private residence once again, having been a tearoom for a few years. According to Wikipedia, the Cambridge Botanic Garden was created for the University of Cambridge in 1831 by Professor John Stevens Henslow and was opened to the public in 1846. This was on a completely new edge of town site to the old Physic Garden in the city centre. 1832 By Spring 1832 a letter to the Gardener's Magazine revealed that planting was still continuing in the Abbey Grounds, and considerable progress had been made in removing the plants from the old garden. Mr Hodson's new house was "in a forward state", and was "in very good keeping with the remains of the old buildings." Townsfolk were preparing to put up a cast iron fence on each side of the Abbey Gate. 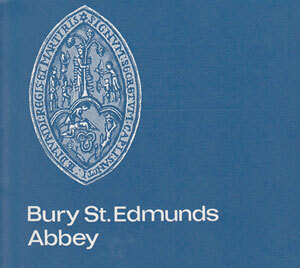 Since 1826, Bury St Edmunds had enjoyed a Society of Archers. By 1832 they were allowed to hold tournaments in the Abbey Grounds. This was much to the distress of one of Hodson's subscribers, who complained about them in a letter to the press. It was generally held that they were an added attraction to visitors rather than a problem, and the complaint was dismissed. 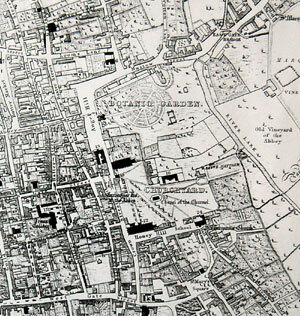 1834 Payne's map of Bury St Edmunds in 1834 shows this original layout of the Abbey Gardens. There are three concentric circles visible, intersected by paths which divide the circles into 24 beds. 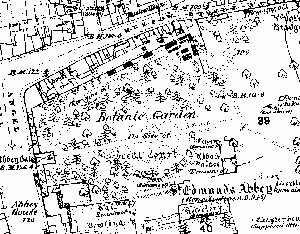 The new Botanic gardens now carried the address, 'Botanic Gardens, Abbey Grounds'. 1835 Scarcity of funds caused the scientific side of the project to give way to the ornamental when the original 2 guineas a year subscription fee failed to raise enough money. In order to encourage more visitors, and to widen the garden's attractiveness, Hodson introduced a menagerie into the botanic gardens. As well as rabbits, guinea pigs and varieties of pheasants, the wildfowl, which still delight children today, were introduced on to the river. However, Hodson included a pair of spoonbills and a stork, as well as the ducks and geese. Oddly enough it is the menagerie which survives to the present day, while the Botanic Garden is now completely given over to ornamental planting. 1837 By 1837, Mr Turner, the Curator of the Botanic garden had raised a new hybrid mimulus in the Botanic garden. He sent it to the Gardener's Magazine, asking that it be named Mimulus hodsonii in honour of his employer, Nathaniel Hodson. Although it was well received at the time, this hybrid has not survived into modern plant lists. In the Online Plant List of 2013 this plant is listed as follows: "Mimulus × hodsonii Turner is an unresolved name". "The record derives from WCSP (in review) which does not establish this name either as an accepted name or as a synonym with original publication details: Gard. Mag. & Reg. Rural Domest. Improv. 13: 333 1837." 1849 In 1849 excavations were carried out by permission of Mr Muskett and the results were recorded in the issues of the "Bury and Norwich Post" during the autumn of that year. These excavations of the east end of the abbey church and buildings near the river was also mentioned in G Hills, ‘The Antiquities of Bury St Edmunds’, JBAA 1865, Volume xxi. 1850 At some point in the early 1850s visitors were allowed into the gardens for a shilling, and children for sixpence. The price was relatively high to control the clientele and exclude "undesirables". 1854 The Assizes for the county were held at Bury on March 27, 1854, and "the Lord Chief Justice having walked in to the Abbey Grounds on Sunday, a shilling was demanded of him for admission. After charging the jury, on the Monday, His Lordship had the Curator, Mr Hodson, before him, and told him it was penal to demand payment for admission to such places on the Lord's Day." 1861 In 1861, Nathaniel Hodson was still presiding over his Botanic Garden, and living within the grounds in the house now known as Ailwyn House. On 10th December, he died, an esteemed member of Bury Society. He had been elected Mayor for the year 1855/56, and was well known on the national horticultural scene. 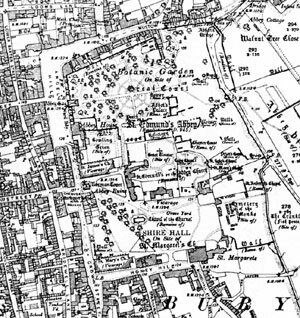 1884 By the mid 1880s this Ordnance Survey map of the town was produced as part of the national series of 1:2500 surveys. 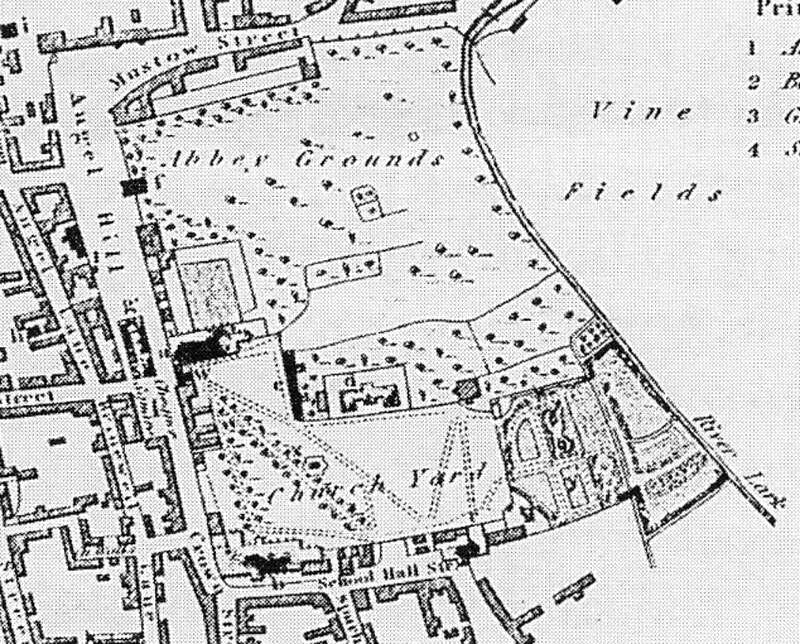 It shows the Abbey Grounds with garden enclosures behind Clopton's Asylum and the adjacent property, possibly called Number One, Abbey Precincts at the time. 1892 Alderman Andrews proposed that the Bury St Edmunds Borough Council should take on the gardens as a public amenity. However, the cost to the rates was deemed unacceptable at this time. Alfred Latimer Hooper obtained a three years lease of the Botanic Garden from Lord Bristol at a rent of £166 a year. 1902 Horace Barker could write in 1912 that, "It will be within the memory of most inhabitants of Bury that in 1902-3 all that is left of the Chapter-house was exposed, and the skeletons of five Abbots, including the great Abbot Sampson (1182-1211), each in its own stone coffin, were discovered. Many pieces of carved, coloured and gilded stone with fragments of marble tiles and glass are preserved in Moyses's Hall Museum". This celebrated excavation of the chapter-house by M R James, during which the graves of five of the abbots were discovered, was probably the most spectacular of all the digs carried out in the Abbey precincts. M R James had found documents in France which described the locations of the Abbots' graves, and his excavations proved the truth of the documents. This happens only extremely rarely. At the time the excavations were carried out, the site was part of the gardens of a house in the Abbey Precincts. The coffins were, at the time, located in the garden of a Mr Henry Donne. On 27th January, 1903, the remains were reinterred under new lids paid for by Donne. The work was carried out by Hanchets the stone masons. 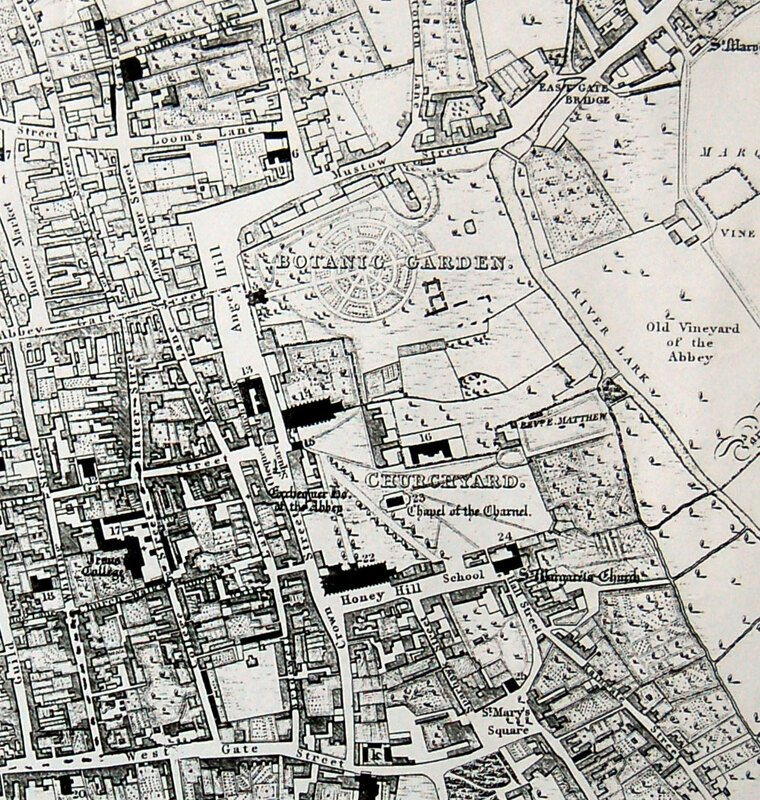 1904 The first revision of the large scale Ordnance Survey map series was in 1904. 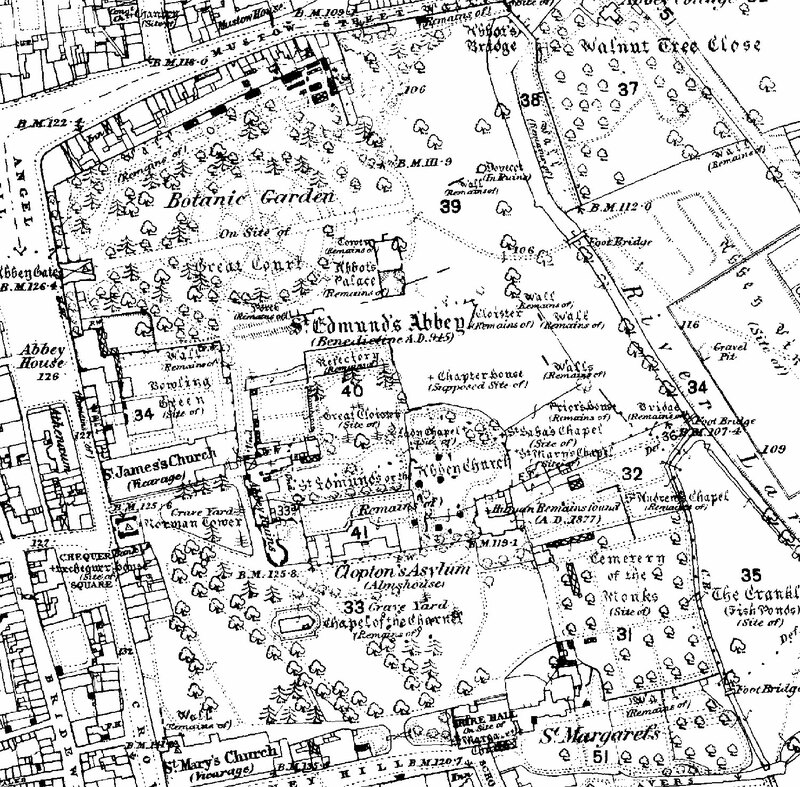 This extract shows the Abbey Grounds by that date. The contemporary buildings are more clearly visible, and the antiquarian detail has been restricted to give greater clarity overall. 1907 The town held a Grand Pageant of St Edmund to commemorate the historical past of Bury St Edmunds. It was performed in the Abbey Gardens. It had been promoted by the Town Improvement Committee. 1909 Following the success of the Pageant, the Town Improvement Committee turned to the idea of making a freely available public park amenity of the Abbey Gardens and ruins. While this idea was being debated, an event occurred to give it a new focus. 1910 The death of King Edward VII and the impending coronation of King George V gave the occasion which the Committee felt deserved to be marked by a new public park. It required £650 to be found for compensation of existing tenancies and costs, and a Public Subscription was launched. Bury's MP, the Hon Walter Guinness, immediately stumped up £200, and with this incentive, the remainder was eventually raised. 1911 A great deal of legal wrangling ensued with the London lawyers of the Marquis of Bristol, led by Alderman Owen Clark and backed up by Alderman Thomas Nice. Clark eventually succeeded in negotiating a settlement. 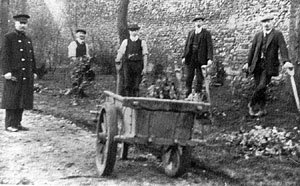 1912 In 1912 the Bury St Edmunds Borough Council took out a lease of the gardens from the fourth Marquis of Bristol for £90 a year. On December 28th, 1912, the Abbey gardens was officially opened as a free park for the enjoyment of local inhabitants, by Lady Evelyn Guinness. The speeches were drowned by a downpour, but a telegram was sent to the King at Sandringham, telling him that Bury's new park had been opened to commemorate his coronation. "It is pitiable to compare the present state of the ruins with what is shown by 18th century prints, or even with what remained in one's own boyhood. The tale of the gradual demolition of the various buildings might form the basis for a sad but interesting record. But it is to be hoped that under the zealous care of the Corporation all that remains of the once magnificent Abbey will be carefully preserved for the admiration and instruction of generations yet to come." 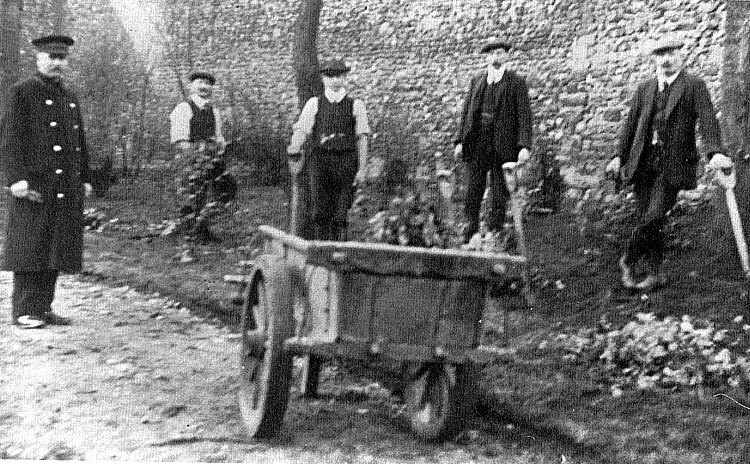 1913 The date of this photograph is unclear, but it was possibly soon after the council took over the gardens. 1933 In 1933 and 1934 there was an excavation of the Prior’s House and corner of the Infirmary by the Town Council (quoted in A B Whittingham, ‘Bury St Edmunds Abbey’, 1951.) 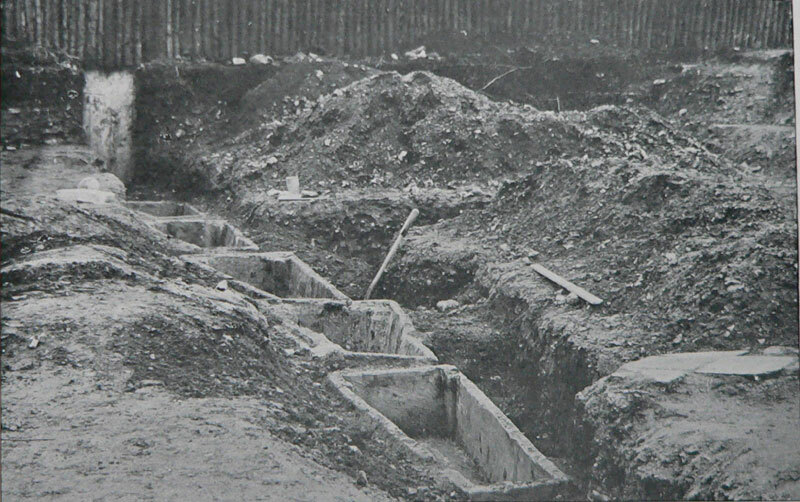 Whittingham also mentioned card index notes on the excavations and a plan of the excavations to 1934 by Frederick Johnson at Moyse’s Hall Museum. The card index notes have gone, but the plan is still on display. 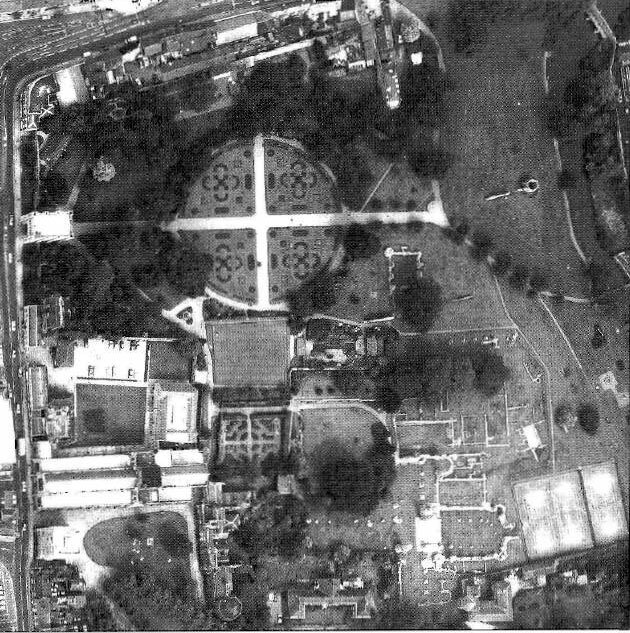 1936 New ideas were incorporated into the Abbey Gardens in 1936, when the old Botanic Garden layout was replaced. 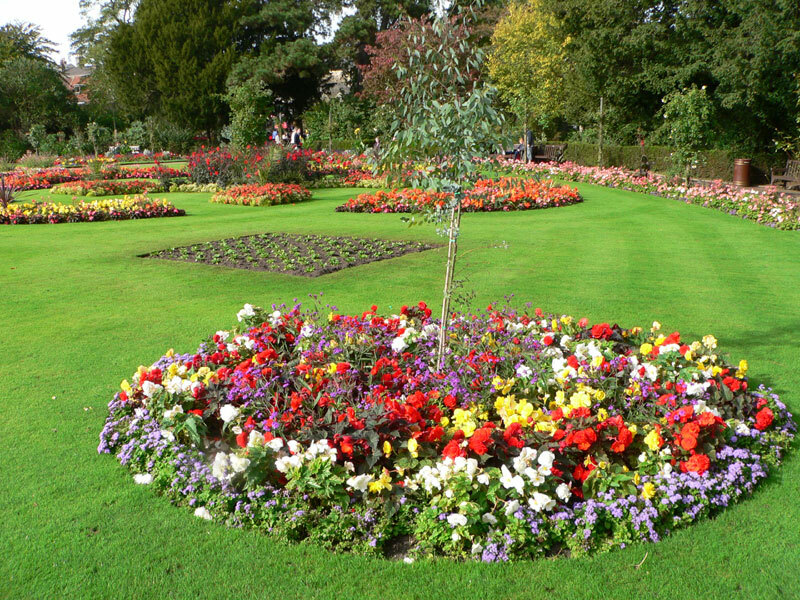 The central area of the gardens was redesigned and Hodson’s concentric circles were replaced by sixty-four island beds which have remained there ever since. The abbey ruins themselves had become very overgrown: the choir altar site was known as the wilderness. 1937 The planting scheme was coupled with an illuminated display which formed part of the coronation celebrations for George VI. 1948 John T Appleby's book "Suffolk Summer" was published in 1948. The author gave the copyright to the Borough Council of Bury St Edmunds. All royalties would be used to maintain the Old English Rose Garden in the Abbey Gardens as a permanent memorial to those American servicemen who gave their lives in the cause of freedom. 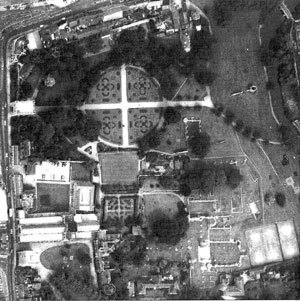 It was officially named the Appleby Rose garden, and is visible to the south of the main central beds and the bowling green in the aerial photograph. In 1948 there were excavations carried out in the chancel of the abbey church by the Borough and published by H J M Maltby, ‘Excavations of the Abbey Ruins’, PSIA xxiv, Part iii. 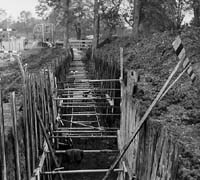 The dig began on 13th December, 1948, under Mr Maltby, the Curator of Moyse's Hall Museum, and Mr Goldsmith, the Council's Borough Engineer and Surveyor. They established that the crypt was present, and finds included some mouldings and painted plasterwork. 1951 One of the most comprehensive archaeological assessments of the site is that of A. Whittingham, published in 1951 as A B Whittingham, ‘Bury St Edmunds Abbey’, Archaeological Journal cviii, 1951, p186. This report would be the basis of the Guide Book to the ruins published in 1971. However, although Whittingham is always quoted as the main authority on the Abbey and its layout, many of his conclusions must be considered conjectural, and are based on other sources. He does not seem to have excavated in the Abbey Grounds himself. 1953 The Borough Council bought the gardens from the Bristol family for £7,814. Many improvements were made to the gardens, but over the years a number of the original trees have died and there is no longer any attempt to be a botanical garden. 1955 In 1955 the area of the abbey ruins was placed into the guardianship of the Ministry of Public Buildings and Works, now known as English Heritage, via various name changes along the way. This effectively meant that their permission was required for any further work to be carried out within the designated area. 1957 From 1957 the Ministry undertook a series of clearances of areas within the Guardianship land, in order to facilitate excavations and stabilisation of the remaining ruins. This work would continue until 1964. This included excavations of the transepts, crossing, eastern chapels and crypt of the church by the Ministry of Public Buildings and Works (R Gilyard-Beer, ‘The Eastern Arm of the Abbey Church at Bury St Edmunds’, PSIA xxxi, 1969, p256-262). 1959 A grand 10 day pageant of 'son et lumiere' was held in the Abbey Gardens to commemorate the death of St Edmund and other historical events such as the town's links to Magna Carta. The pageant marked the first celebrations of the newly formed Magna Carta Trust. 1961 In Bury a major project was taking place to replace the main sewerage system for the town. Trunk sewers up to 4 feet in diameter were installed through the town and out to Fornham Park. As they worked by gravity they tended to follow the bottom of the river valleys of the Linnet and Lark as far as was practical. 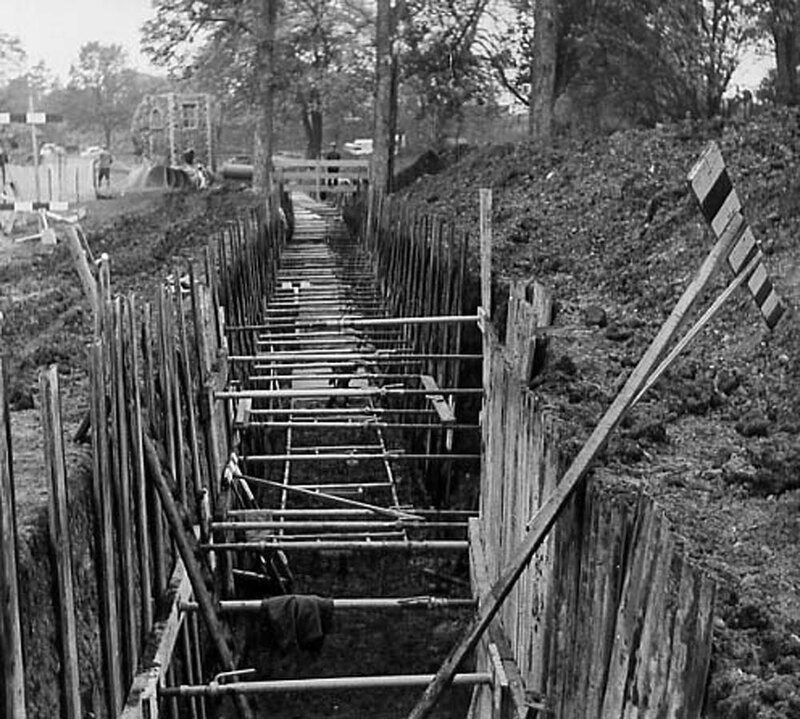 They went through the Abbey Gardens and along Fornham Road, and the pipes were often set into deep trenches, depending upon the lie of the land. This photograph shows the destructive effect of this work upon any archaeological layers within the Abbey grounds. However, it is likely that this sewer merely replaced a previous one, although the new sewer was much larger. 1971 In 1971 the Department of the Environment was the successor to the Ministry of Public Buildings and Works, and held the guardianship of the abbey ruins. The Department published this guidebook to the Abbey ruins based upon the 1951 article by A B Whittingham. It was on sale for 15 pence. By 1976 a third impression was on sale for 40 pence, and it is still in print today. 1976 In 1976 and 1978 there were excavations in the Queen’s Chamber undercroft by English Heritage which provided evidence of Saxon settlement. 1987 In 1987 and 1988 there was an excavation of the area beneath the proposed cathedral extension carried out by Suffolk County Council Archaeological Unit. This showed that a Saxon road probably ran right through the precinct linking Northgate Street to Sparhawk Street and thence to Southgate Street. 1990 By 1990 there was the possibility of using non-invasive Geo-physical techniques to identify sub surface features without any disturbance. This seemed to offer an exciting opportunity, and a resistivity survey was carried out by English Heritage in the areas of the Infirmary, Abbot’s Garden, Dovecote and the supposed site of a watermill. This plotted traces of walling and other underground features, but was largely disappointing. (English Heritage, Ancient Monuments Laboratory Report 100/1990, Author, Payne A W). 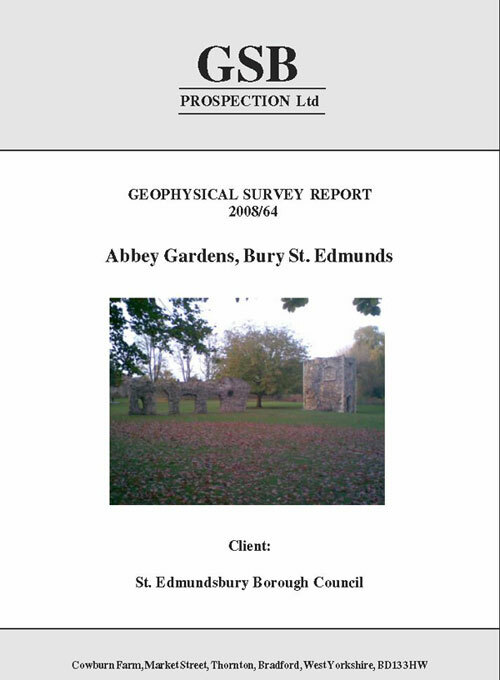 "This report describes a resistivity survey which was conducted in the grounds of Bury St. Edmunds Abbey in the areas of the Infirmary, Abbot's Garden, the Dovecot and the reputed site of a mill. The findings indicate that extensive buried foundations of walls and buildings are likely to be present in many of the areas investigated. Although the geophysical response was good, the definition of precise structural patterns was not particularly clear." 1995 In November 1995, the Council entered into a local management agreement with English Heritage, whereby they took over managing the guardianship area for a period of five years. The agreement was extended a further ten years thereafter and is due for renewal in 2011. English Heritage make an annual financial contribution towards the upkeep of the area under this agreement. 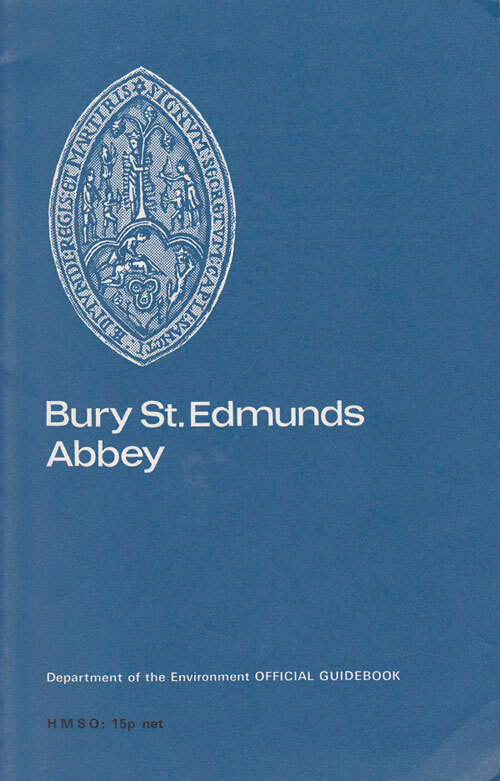 1999 Since 1953 many new specimen trees have been planted and a Botanic Guide to the Gardens was published by the St Edmundsbury Borough Council. 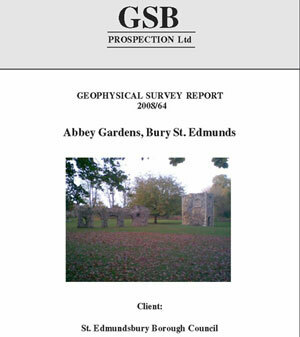 2008 A new Geophysical survey of parts of the abbey precinct was carried out by GSB Prospection Ltd for the Borough Council under the management of the Suffolk Archaeology Service. Survey methods used were: Magnetic (Gradiometer); Resistance (0.5m and 1.0m Twin Probe); and Ground Penetrating Radar (GPR). All three techniques detected the continuation of a wall extending from the Dovecote tower. The resistance survey has identified several other responses which may be of archaeological interest but interpretation of many of the responses was complicated by the potential effects of modern land use including landscaping, trees, and garden features. Modern factors have produced widespread ferrous disturbance in the magnetic data, effectively masking any weaker responses, and very few anomalies of possible interest have been identified. The GPR survey over the tennis courts also proved disappointing, with most of the recorded responses attributed to material used in construction of the courts. 2009 In December, 2009, a new Management Plan was produced for the Abbey gardens. It discussed the site's history as an abbey, as a private garden, a private Botanic garden, and then as a Pleasure Garden open to the general public. Options were discussed for the future enhancement of its role as a Pleasure Ground, while safeguarding the archaeological features. Also in 2009 a report was published by the Suffolk Archaeology Service entitled, "ARCHAEOLOGICAL ASSESSMENT, SCCAS REPORT No. 2009/136 Abbey Gardens Low Impact Evaluation BSE 332." It described a series of boreholes and soil cores that were taken, along with several test pits, to support the evaluation of any future leisure projects that may become desired within the Abbey gardens. The investigation found that many of the remains were close to the surface, as the land surface was still very much as it was during the monastic period. The old course of the River Linnet through the precincts was confirmed, and cereal processing had taken place on the site adjacent to where Whittingham had suggested a watermill had once stood. 2014 In May the water garden was re-opened following a £30,000 donation for the purpose from an anonymous visitor to the Abbey Gardens. A further £10,000 was donated to allow the Sensory Garden to receive a make-over. Lectures by Dr Pat Murrell on "Bury St Edmunds' First Botanic Garden"